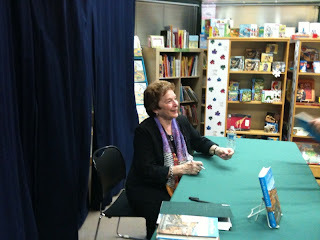 At a book signing at Kepler's Books in Menlo Park recently, I had the pleasure to listen to Frances Mayes, author of Under the Tuscan Sun : At Home in Italy, talk about her fascinating life in Tuscany. Mayes spoked about how food and community are deeply intertwined. As an example, after the olive harvest, locals go to the piazza to share their olive oil with one another while each one believes his/her oil to be the best of the lot. When asked about her favorite food experience in Italy, Mayes mentioned the first communion celebration of a neighbor's child where 140 people were invited and a procession of pastas were served at the end of which, four men carried a roasted cow from the Val di Chiana. She said that in Italy, an eight-hour meal would not be unusual and that guilt is never associated with food.